Star Wars fans are going to love this one. It gives you the opportunity to play as a frontline troop in one of the four main armies in the Episodes 1-6. Controlling your soldier is very easy. I figured out how to work the game within about 30 minutes. The only problem I have is with piloting the aircraft. This is very difficult to do and I would highly suggest changing the default controls. I personally prefer to pilot with my keyboard rather than my mouse. But using all the other vehicles is very easy. I really liked being able to switch between guns while using a vehicle (such as the side guns on the Clone fighters). There is a small amount of strategy in this game, but not enough to scare away all you first person shooter people. There are two things you can do in order to win a battle. 1. Kill all your enemies 2. Capture all of your enemy?s command posts. Killing everybody in your path if fun to do, but not as effective as you might think. Capturing command posts provides you with a definite advantage. If you capture a command post, it provides your army with another place to spawn your fellow units. You want to have a mix of destroying your enemy?s units and capturing command posts. If you can balance these two, you?re guaranteed a win. The first thing that I noticed about Battlefront is that it isn?t like other shooters where you have a big health boost over your enemies and are able to kill everyone in an entire base by yourself, while surviving 30 story falls and 15 lbs. of lead being pumped into your body. You die just as fast as your teammates or your enemies. Fortunately, you are significantly smarter than your enemies, which is your only reason for survival. You have no health bonus ? period. Luckily, you can re-spawn as another unit from the command post of your choice. While in a battle, you have four or five different units to choose from. Each one has its own strengths and weaknesses. There are basic units that each army has. They all have the same purpose; they only look different and have slightly different weapons. These basic units are: Frontline soldiers, snipers, pilots, and demolitions experts. Each army, however, has one special unit of its own. I will briefly describe these. Clone Army: The Jet Trooper. The Jet Trooper is the closest to Jengo Fett as you can get because of the jet pack it has on its back. This jet pack allows you to fly for a short distance. The two guns that the Jet trooper uses are the EMP Launcher, which works well against large groups of droids and taking down a Droidekas\' shield, and a Commando Pistol, which is much like Jengo Fett?s pistols that he uses in Episode 2. Seperatist Forces: Droideka. Droidekas are probably the most dangerous unit in the Seperatist Forces. They can fold up and roll to where the battle is, then unfold, turn on their shields, and blast anything in their way. The droideka (or Destroyer Droid) is helpless without its shield. However, the shield lasts for a good amount of time before it has to rest and recharge. Direct shots from grenades, missiles, or energy blasts will remove much of the shields power. When the shield?s power gets down to zero, it will evaporate, and you will be open to any attack. If you?re in the thick of a battle, you will die almost immediately. These droids are best used on the frontlines because of how inaccurate their guns are. Sniping is a very bad idea. The blast bolts shoot fast (the fastest in the game) and very thick, but are inaccurate. The Empire: The Dark Trooper. The idea of the Dark Trooper didn?t come along until after Episodes 4-6 were made, which is why you won?t recognize them unless you\'re a devout Star Wars fan. They too, like the Jet Trooper, feature a jetpack. However, it isn?t designed for flying, which is why I don?t like them. Instead, these jetpacks help them to ?jump? to their targets, closing the distance between them and the enemy. The jetpack recharges VERY SLOWLY, unlike the Jet Trooper. You won?t be able to jump in, shoot some guys, and jump back out to safety. The gun they sport is a blast cannon, much like Super Battle Droids? tri wrist blaster. It fires out five blaster bolts that quickly spread out, making it a good gun to use when there?s a large number of infantry close together. They also have a blaster pistol and grenades. The Rebels: The Wookie Smuggler. 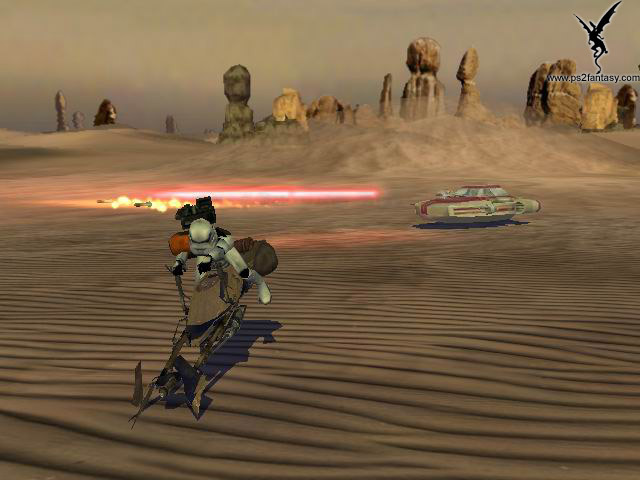 I consider the Wookie Smuggler to be the weakest unit in the game, even worse than the Trade Federation?s battle droid. They run slowly, they don?t have grenades, and their bowcaster doesn?t fire fast enough to meet immediate battle needs. All you Chewbacca wannabees are going to like this guy, but not anybody that wants to win a battle. Instead of grenades, the Wookie Smuggler has a time bomb. It?s much easier to go get a Rebel soldier than learn how to master these guys. There are a number of different modes in Battlefront. Instant Action is good for beginners who don\'\'t know how to play. It\'s like a practice round. It operates like a regular battle, but you\'\'re not playing for any particular reason. The campaign mode allows you to play in battles in some famous battles that occured throughout Episdoes 1-6. Galactic Conquest is my personal favorite. You start by choosing which era you\'\'d like to play in. Then, you go to war. The enemy starts out by owning all the planets except one. Each of these planets has its own planetary bonus. If you have complete control of the that planet (each planet has two levels you must beat in order to control the planet) you can use that bonus. The bonuses vary from Healing Power, to Elite Training, to many more. Everytime you defeat a level, you get to choose which to attack next. If you lose a battle, the enmy gets to decide where to attack next. The sound is great. It?s pure Star Wars. The sound track comes straight from John Williams? compositions. When playing in the Clone Wars era, you hear music from the first three episodes. While playing in the Galactic Civil War, music from the last three movies will play. One thing I really like is the way the music will slowly get louder and louder as you start heading into the thick of the battle. It really gives you the feeling of being right in a Star Wars movie. The battle sounds are fantastic in Battlefront. From the crunch of the AT-AT Walker walking across the snow, to the zoom of a speeder bike as it zips past you, everything is perfect. The graphics are very good. The terrain is excellent. I love playing in levels that have water in them because it looks so real. You couldn?t tell the difference between real water. It?s without a doubt the best I?ve seen in a video game. Another thing that I love about Battlefront is the physics. When you get hit by a grenade or a big blaster shot, you will go flying and tumbling and spinning, with arms flailing and legs kicking. Once you hit the ground, you tumble a little more and then finally roll to a halt. I almost like dying as much as I do killing other people in the game. Unfortunately, there is a problem here. Right after you are done with your little tumbling dance, your body stays the same. Thus, if another grenade comes after and hits your body, you go into the air but you?re basically like a statue. You don?t move at all. This bugs me a lot. I love good physics in a video game, and I hate it when little details like that are left out. Another bad thing that drives me nuts is that while playing the Kamino level, you will get knocked off the walkways and into the ocean below. There is no splash at all. That also gets on my nerves. Despite this, the physics are still very good. The soldiers also look good. However, the Rebel units do not wear helmets so you can see their faces. This isn?t a bad thing, but each separate unit has the same face (for instance, all the Rebel Vanguards have the same faces, and all the Marksmen will have the same exact face). It?s not a major problem, seen as the Rebels are really the only group that don?t wear helmets that cover the whole face. Battlefront is a fairly violent game. People do go flying through the air when they are hit by a grenade, and the deaths can be sort of gruesome. Also, when not playing as the droid army, the soldiers will scream in pain when they are hit (actually, I thought the voice acting was great). But there isn?t any blood and the bodies disappear within about five seconds. Plus, you do fight droids some of the time, which is better than killing humans. Star Wars Battlefront is one of the best S.W. games I\'ve played. I highly suggest it to Star Wars fans and anyone who likes the Star Wars video games. It would score higher except for the appropriateness.